The Americans with Disabilities Act (ADA) is a civil rights law enacted in 1990 to prevent discrimination against individuals with disabilities. The purpose of the ADA is to ensure that disabled citizens have the same opportunities and rights as others by ensuring that public areas and businesses are accessible and amenable to anyone with a physical disability. Violating the ADA can land you with a hefty lawsuit and serious fines. Here’s what you can do to avoid this kind of a lawsuit, and what to do if you’ve been accused of violating the ADA. -Narrow aisles, hallways, or doorways that are not accessible to a wheelchair or other mobility device. -No reserved handicap parking spaces. -Dressing rooms that are too small for anyone using a mobility device. -No bathroom stalls accessible to someone in a wheelchair. -Stairs with no alternative access route (either a ramp or elevator). If you’re not confident in your ability to properly assess potential barriers, seek the input of someone with a disability. Allow them access to your business and have them complete a survey regarding any issues they encountered. Your staff members are key in ensuring your business remains ADA compliant. For example, a retailer can’t be expected to keep all merchandise within reach of someone confined to a wheelchair; this is simply not an efficient use of retail space. So, your staff members need to be trained to look for customers who may need assistance reaching items, reading tags and labels, or just getting around the store, and offer help whenever they can. Communication is also a key component of the ADA, and it can get very complex depending on the type of business you own. For example, your restaurant or retail store may be able to communicate with deaf customers by writing notes. But if you own a doctor’s office or law firm, the information you’re trying to convey can be too lengthy and complex for a note, so you may need to hire a sign language interpreter to remain ADA compliant. When the ADA was first implemented, accessibility to websites was not a major concern. Now, however, a great deal of purchases are made online, so it’s important that your website is accessible to anyone who might have a disability. So, look over your website and try to identify any areas that are not accessible to those with a vision or hearing impairment. If you have videos on your website, make sure they have captions. Avoid posting images with text in them so that text-to-speech readers can identify all of the content on your website, and make it accessible to those with vision impairments. ADA compliance is not limited to making your business accessible to customers; it also includes creating a work environment that is accessible and amenable to individuals with disabilities. This means offering the same employment opportunities, training, benefits, promotion opportunities, etc., to individuals with disabilities as you do to able-bodied employees. Review your hiring policies, and ensure anyone responsible for hiring employees is aware of ADA requirements on this matter. If you have employees with any kind of disability, try speaking to them and asking if they feel that your business has been accommodating to their needs. Why the ADA does not require you to make excessive changes in your office to accommodate those with disabilities, it does require you to provide “reasonable accommodations” based on employees’ needs and the cost to your business. 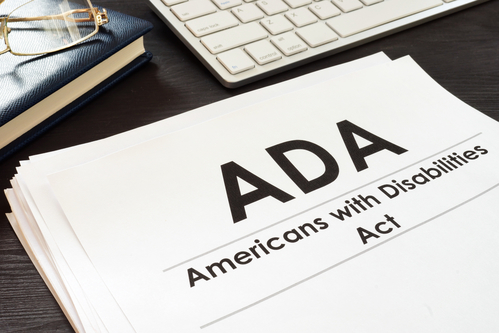 If you’re already facing a lawsuit for violating the ADA, contact an ADA attorney right away. While this law has greatly improved the lives of individuals with disabilities, it has also become the grounds for many frivolous lawsuits—especially in Florida—so it’s important that you’re aware of your rights and how to protect your business from such accusations. Contact The Harr Law Firm today, and we’ll help to build a strong legal defense that will protect your company from groundless lawsuits designed to seek fees from your business.